FREE TO AIR / BISS DECRYPTION RF TUNER TO IPTV GATEWAY HEADEND. Up to 256 SPTS output, 32SPTS out with program demux PID filtering and re-mapping, 20 SPTS with BISS decryption. UDP or RTP/RTSP. Unicast or Multicast. multiplex PID filtering and remapping. PCR adjust. PSI/SI edit. descrambling BISS Modes Biss-1 and biss-e. MAX 20 BISS KEYS. 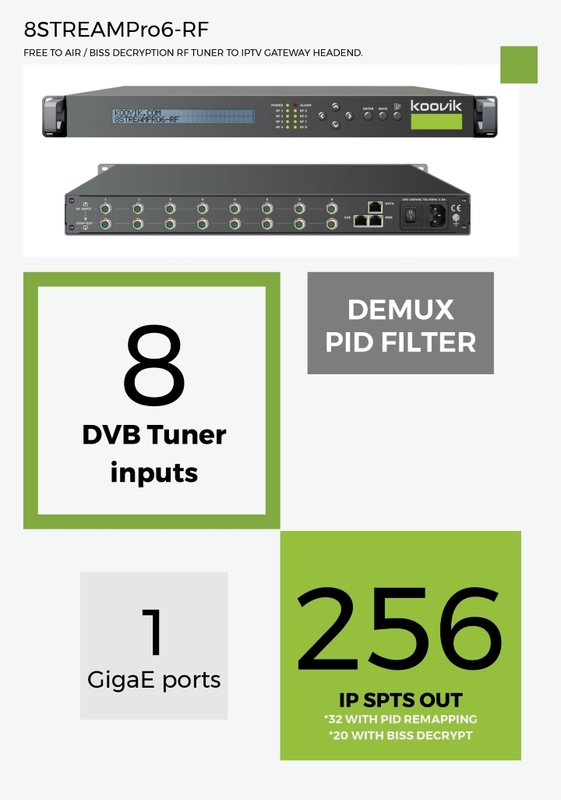 output network 1 GigaE. 800Mbps max. output throughput. UDP or RTP/RTSP. Unicast or Multicast. SET-UP front panel BUILT-IN KEYBOARD AND LCD DISPLAY. NMS Embedded web server (english). local and remote.